Buyers interested in purchasing a home in Colorado Springs may not be aware of the abandoned mines located in various areas of the city. This topic intrigued me so I completed research to find out more information about the abandoned mines and subsidence issues in Colorado Springs. 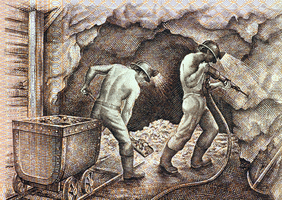 Coal mining took place in Colorado Springs from the late 1800’s through the 1950’s. The room and pillar mining method was commonly used and over time, these coal (or timber) pillars supporting the roof of the mine that were never removed could collapse or erode. Pikeview was one of the largest coal mines that operated from 1900-1957 in the Northwest/Rockrimmon area of Colorado Springs. Another large mine, Rapson (1901-1916) was located underneath what is now known as the Cragmoor and Country Club areas of Colorado Springs. The coal mines in the Rockrimmon area were deep with vertical shafts whereas the mines in the Cragmoor/Country Club, Rustic Hills, and Palmer Park areas were low angle, sloping tunnels and those appear to have more issues with subsidence since they are more shallow. There are documented incidents of subsidence, most of which took place in the 1980’s. These incidents of subsidence included surface cracks, structural damage to homes, dislocated sidewalks, sags, holes, cave-ins, and collapse pits. The issues were addressed by back-filling the problematic areas. The Country Club Area appears to have the most issues with subsidence up until recently (2005). There is an affordable Mine Subsidence Protection Program available to those living in areas where subsidence is a risk. To learn more about the Colorado Mine Subsidence Program, the Colorado Inactive Mine Program can be reached toll-free at 1-800-44-MINES (1-800-446-4637). For those who are interested in researching abandoned mines a little further, the Penrose Library located in downtown Colorado Springs offers a large collection of subsidence maps for reference. If you are looking to purchase a home in Colorado Springs, contact Patricia Beck at 719-660-9058 or visit www.patricia-beck.com.